When practising Qigong 氣功 or meditation 静功, have you ever had the experience where something suddenly comes to you mind? It might be something you need to do, something you may have forgotten about, or that you suddenly understand a problem or question. When we have been practising Qigong for long enough, these reactions will happen. This is all because we are relaxed, calm and stress free, then our mind becomes emptier and can let go more. Often I will stop my practise and get a pen and paper and write something down that has popped into my mind. The mind is amazing. When we want to remember or work something out, no matter how hard we try we cannot do it, but when we relax and enough Qi goes to the brain we can work it out or understand certain things. This is why the more we practise Qigong and wiser and calmer we will be. In our brain there are so many different areas that control different functions, however there is not enough Qi and we do not relax enough these areas that will not work so well. 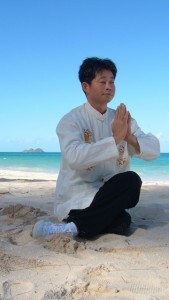 With regular practise our bodies will become more balanced as it our Qi heals the imbalances and clears the blockages. Then we can develop our minds as the Qi will go to our brains. This is why Jing精, Qi 氣and Shen神 are in this order. It also means that health is first.